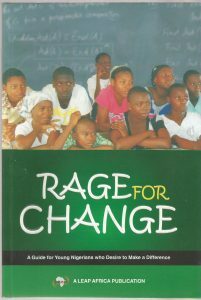 This all impactful book ‘Rage for Change’ primarily written for youths, is the spark that could light up a new horizon on the surface of poverty in Africa if approached with an insightful perception. 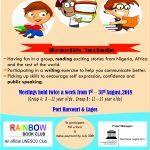 Its sole objective is to convince the youth of Nigeria that they CAN be leaders and instruments of change. 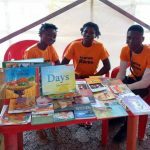 The book in 6 chapters provide youths with practical tools and stories needed to be stirred to take a stand for change in their communities. In the first chapter “What’s up?” a series of problems are presented that are actually the realities of some of the uninformed youth of our society. 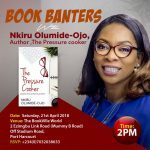 It discusses the problems that ordinary people in Nigeria face and urges the reader to be angered and stirred into action by using hypothetical scenarios and real-life experiences of Nigerians today. It also presents possible solutions for each problem in a youth friendly way. The second chapter “why wait” exposes the advantages of being a youth, excuses youths give and who a true leader is. It shows clearly through practical examples that age is nothing but a number and shouldn’t keep one waiting. The third, fourth, fifth and sixth chapters sets one on the go. It provide insights on how to become a change agent; finding your passion, developing a game plan, putting your plan into action and tips in making the process of positive change easy. Rage for Change is proof that what makes a leader isn’t restricted to just accomplishing great things, but doing little unique things that anyone who has a heart can do. It demystifies the concept of leadership and brings it within the sphere of influence for everyone – especially the youth.